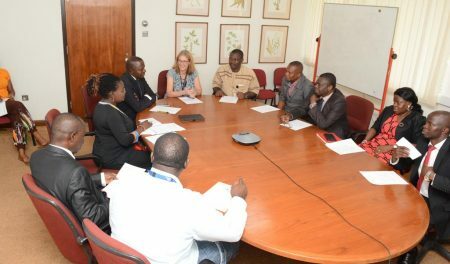 Representatives of two local entities—the Federal Road Safety Corps (FRSC) and the Oyo State Security Services (SSS)—visited IITA in Ibadan recently and assured the safety and security of staff. A recent training workshop held and hosted by the IITA Southern Africa Research and Administration Hub (SARAH) in Lusaka, Zambia on 21-24 March, on Breeding Management System resulted in shared enthusiasm by participants – mainly soybean breeders from national programs in the region – to use and adopt Breeding Management System (BMS) in their respective soybean breeding programs. In early March, 50 international breeders gathered in Ibadan, Nigeria, for the AfricaYam project’s third annual progress review and planning meeting, which looked at the progress of yam research in West Africa.